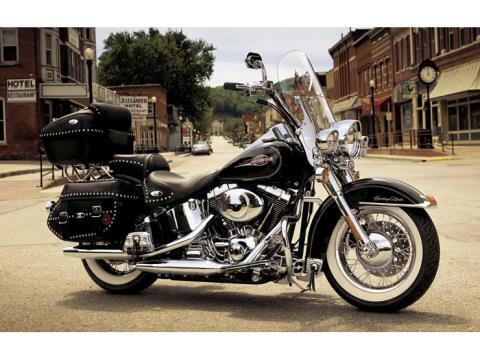 In the saddle of a Harley-Davidson® Softail®, no road is ever lonely. Sunlight breaks through treetops to dance on chromed steel. The wind offers its constant stream of praise. And the world unfolds before you with open arms. Maybe it’s because nothing else on the road compares with the timeless hardtail styling ... and nothing else feels like a Twin Cam 88B™ power mill rigid-mounted to the frame. Counterbalancing takes care of all but the good vibrations. You and the motorcycle become one, united by an unbreakable bond. Then you feel the hidden rear suspension smooth out the ride with a full 4" of travel. There’s no denying you’re in the saddle of a rolling masterpiece. 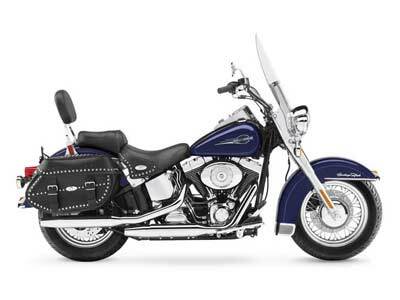 This year, the Softail family of custom motorcycles welcomes its latest member. We invite you to turn the page and take a gander at the clean lines of the new Heritage Softail®. Additionally, all new bobtail models get a shot of adrenaline in the hindquarters — a brawny, road-hugging 200mm tire under a new wider fender. More rubber to stick to the pavement. More style to keep the eyes glued. Throw a leg over a Heritage Softail® Classic, and just like that, you’ve bought yourself a one-way ticket to happier days. One look at the studded leather bags and you can’t help but grin. Beefy tires on optional Chrome Profile Laced wheels, graced by chrome-accented fenders. King-size detachable windshield. Low two-up seat with backrest. Giant chrome headlight and passing lamps. This is how the early dressers did it. Today’s version combines all this with the best of today’s technology. 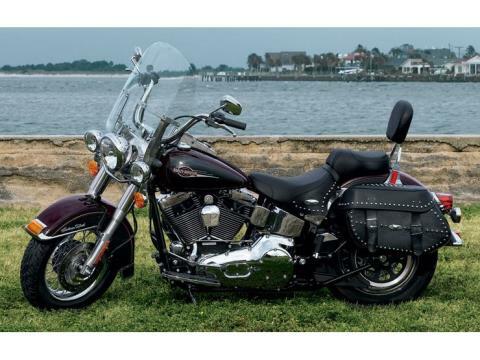 For example, the Classic gets a wrinkle black and chrome Twin Cam 88B® engine with smooth-riding dual counterbalancers. Fire one up and good feelings fill the soul. For a limited time, we are offering one-of-a kind, custom color combinations that are over and above the standard two-tone color options available during the model year. These limited color combinations come with a custom decal that is only available through the Custom Color program. Each color has unique complementing pinstripes.